Although the R7000 is fast, it costs around the same amount as the Linksys EA6900 and the Asus RT-AC68U. These routers don't look as good, but have much better software. But the R7000 is still a fine router, and a worthy investment if you shop around for a deal. The Netgear R7000 Nighthawk is a router that squeezes as much as possible onto the specification list. With a reasonably high price of £165 (US$184, AU$255), it's a high-end model, and it comes with a 1GHz dual-core processor. It supports triple-stream 802.11ac connections for up to a (theoretical) 1300Mbps, with TurboQAM supported over 802.11n, which means you can get 200Mbps per stream, rather than the standard 150Mbps, provided your computer's wireless adaptor supports it. 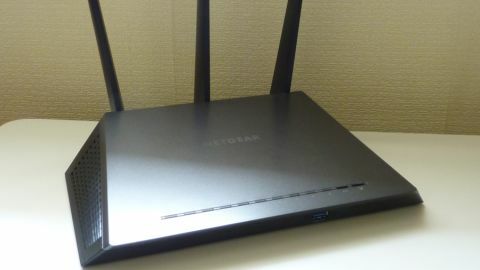 The Netgear R7000 also sports a black and dark grey angular design that looks rather cool, in my opinion. Quite clearly the product's name comes from the similar look of the US military's Lockheed F-117 Nighthawk stealth bomber, which utilises similar dark colouring and sharp angles to avoid radar detection. Even the antennas are polygon shaped. It isn't hard to see why Netgear has done this. Routers are, by nature, boring devices. They're an essential part of the plumbing for your home computing environment, but when they're working well, they don't get in your way and are forgotten about. The market is incredibly crowded as well. Dozens of electronics manufacturers are churning out routers, many of which are high quality. So to inject some sense of personality and uniqueness to products, a memorable name and bold design works wonders. That's exactly why AVM's Fritz! Box routers have such a novel colour scheme. There are twelve white LEDs on the front of the R7000, each twinkling on and off to show the state of various router functions such as 2.4GHz wireless, 5GHz, USB connectivity, power, and so on. Twelve seems slightly excessive, but at least they aren't retina-burning bright blue. And as I found out later, they can be turned off. You get a USB 3.0 port at the front and a USB 2.0 port at the back, with four Gigabit Ethernet LAN ports and another for WAN. There's an air vent on each side, which looks good, although it could easily attract a lot of dust over time. But a flashy appearance and snazzy name are worthless without high performance and well-designed software, and I'm pleased that the Netgear R7000 ticks these boxes, too (for the most part).